While ghosts floating around with big, white sheets over them may seem like an old stereotype, those spooks may actually be onto something. But instead of just a plain bed sheet draped on their head, a captivating specter could wear a ghostly white, full length dress, with eerie figures and designs incorporated into the fluttering fabric. And as if that didn't already sound creepy enough, a hooded cape that matches the dress could make a spirit look even more hauntingly beautiful. All this alluring apparition would have to do is hypnotize her prey into a false sense of calm, and then that soul will be easy pickings. Whew, did anyone else get goosebumps just now? You can see what we mean by your fellow party guests feeling a little uneasy when you're gliding around the room in this lovely but dreadful costume. 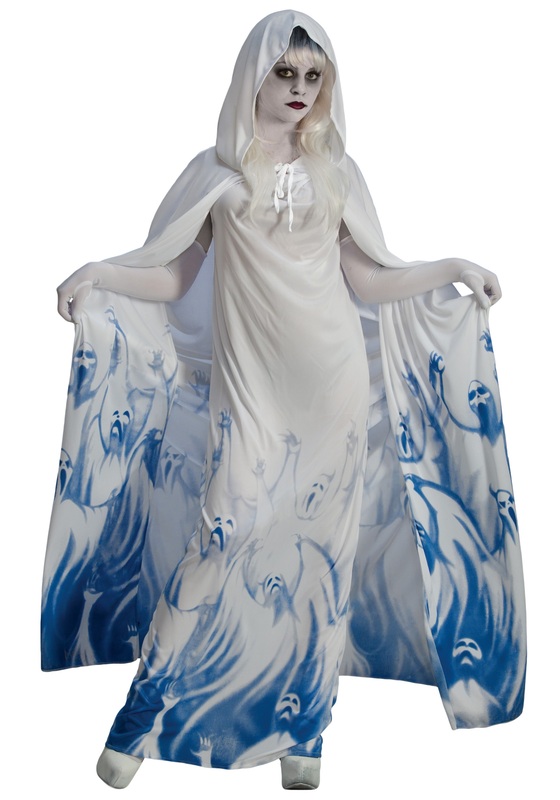 The matching dress and cape are made of polyester (instead of ectoplasm), and feature ghastly blue designs printed along the bottom half. Whether you're wearing it by itself, or with pale makeup and deathly eye shadow to look as cold as a grave, you're sure to put a chill on everyone's spirits (but in a good way)!